The black Aicok Centrifugal Juicer Extractor that we’re reviewing today is the upgraded 2018 model for processing fruits and veggies with user-friendly functions like two speeds, a large feeder, anti-drip function and the BPA-free food grade stainless steel. It scores 4.8/5 stars out of 26 customer reviews indicating a high level of customer satisfaction. Despite a decent amount of motor power, it runs quietly at a reasonable noise level of 60 decibels. You don’t have to peel or slice your fruits and veggies as you’ll fit many items through its 3-inch feeder tube. It offers instant juice extraction as you can make a 15-ounce cup of juice from whole fruits in less than ten seconds. And it is easy to clean once you’re done with juicing. It is not too big but not too compact and is easy on the eyes with its sleek and professional design. It weighs only 3 pounds and measures 11.6 x 8 x 12.3 inches. You will experience zero or very little foaming with this centrifugal juicer and there won’t be any clogging. You won’t need to put much effort or time into preparing the ingredients. Anything that comes in contact with food is free of BPA, including the stainless steel cutting disc with the Italian micro mesh filter. You can expect up to thirty percent more juice and forty percent minerals and vitamins. It has a 400-watt power motor and dual speeds of high and low. The high rotating speed of 15,000 to 18,000rpm is good for things like beets, celery, carrot, kale, collards, ginger, and others. And the low speeds of 12,000 to 15,000 rpm are good for soft fruits like tomatoes, melons, grapes, and oranges. There is the security locking arm that ensures the lid is shut properly and the Overload Protection System will turn off the unit in case of motor overheating, idle run, faulty assembly and the unstable power supply. There are also the anti-slip rubber feet underneath the juicer and it will stay put during the operation. The juicer mouth has an anti-drip function so the juice doesn’t come out unexpectedly when you don’t have a cup underneath and make a mess on your counter. You will get healthy and tasty juice without any added preservatives, additives or sugar but full of vitamins, minerals, and healthy enzymes. Please make sure you have the unit running for a maximum of one minute and you need to let it cool down for a couple of minutes before running it again. Please do not put the plastic parts into the dishwasher as it can be hot in there, and clean them with water and brush. And follow the instructions on the Amazon product page and the manual that comes with the product. 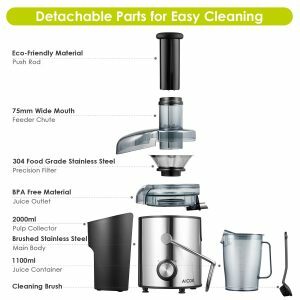 You will get the 304 stainless steel main body and precision filter, the juice outlet, pushing rod, the juice jug, the residue barrel, 3-inch feeder tube and the user manual with the three years of warranty. It looks nice, works well, runs fairly quietly, juices pretty quickly, is easy to clean with the parts coming off quickly, and offers very good value for money overall. 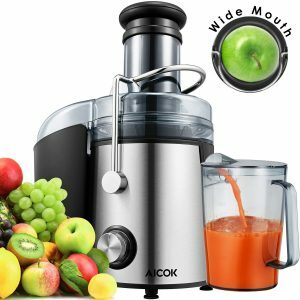 Aicok Wide Mouth Juicer is offered with three years of warranty by the manufacturer and you can benefit from their customer and technical support 24 hours and 7 days a week.